Isuzu Assist is not the typical let's-take-the-easy-way-out 'bolt-on' roadside assistance service that is actually provided by the auto clubs of Australia. It is in fact a genuine Isuzu operation that's designed for the trucks in our range; from our car license truck models to our 68 tonne GCM prime-movers. 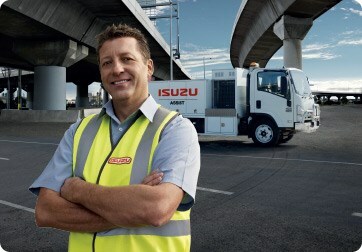 Isuzu trucks are renowned for their reliability. But there are many reasons for roadside assistance, apart from mechanical breakdown. If you ever run out of fuel, lose your keys, get a flat tyre (or battery), or face other problems that come with spending time on the road, contact Isuzu Assist on 1800 947 898. And while the program was created for Isuzu customers, feel free to call the number even if you operate another brand and happen to need help#.